Political parties loyal to Ivory Coast presidential claimant Alassane Ouattara have called a general strike across the country from Monday to force the incumbent president to cede power. Our correspondent John James says the strike is not being widely observed so far in Abidjan, the biggest city. Laurent Gbagbo has refused to step aside following November's disputed election which he insists was rigged. Mr Ouattara has been recognised internationally as the victor. Regional West African grouping Ecowas has warned it may use "legitimate force" to remove Mr Gbagbo. He accused the US and France of leading a plot against him. Mr Ouattara's spokesman Patrick Achi said on Sunday: "I can confirm that we have called for a general strike across the nation from tomorrow." A statement from Mr Ouattara's party added: "We should not let them steal our victory." Our correspondent in Abidjan says the city is relatively quiet but a lot of people are going to work and many shops are open. He says people do not want to put their heads above the parapet at the moment - even those who may have voted for Mr Ouattara - because of the possibility that Mr Gbabgo could stay on in power. The United Nations, the European Union, the US, the African Union and West African regional bloc Ecowas all say that Mr Ouattara won the 28 November vote. The call for a general strike echoes a similar call last week by the man who would be Mr Ouattara's prime minister. Most civil servants are already staying away from work in the general confusion caused by the swearing in of two presidents, each with their own set of ministers. Although the situation has felt less tense since the lifting of an overnight curfew, there's concern that things will worsen in the coming month. A delegation of heads of state from Ecowas - from Benin, Sierra Leone and Cape Verde - is planning to travel to the country on Tuesday to convince Mr Gbagbo to step aside. Mr Gbagbo's Interior Minister Emile Guirieoulou told a news conference that his government would: "welcome the three heads of states as brothers and friends, and listen to the message they have to convey". Our correspondent says that after calls from the US and French presidents, this personal visit will represent the final notice for Mr Gbagbo, whose hold on power is diminishing by the day. He adds that any intervening force would almost certainly come from Nigeria. On Sunday UK Foreign Secretary William Hague expressed "deep concern" at the situation and called on Mr Gbagbo to step down. In an interview with French newspaper Le Figaro, Mr Gbagbo said that if military intervention occurred it would be a dangerous precedent. "All threats must be taken seriously. But, in Africa, it would be the first time African countries would be ready to go to war because an election went badly." He repeated his assertion that he was the victim of an international plot against him, led by former colonial power, France, along with the US. "If there is an internal conflict, a civil war, there will be risks because we will not allow our rights, our constitution, to be trampled on. People have to remember that. We are not afraid. We are not the aggressors." Earlier, his spokesperson warned that foreign intervention could ignite a civil war, sparking conflict between the country's many foreign migrant workers which could spill across Ivory Coast's borders. "All these countries have citizens in Ivory Coast, and they know if they attack Ivory Coast from the exterior it would become an interior civil war," Ahoua Don Mello said. "Is Burkina Faso ready to welcome three million Burkinabe migrants back in their country of origin?" he asked. Millions of West African immigrants from poorer neighbouring states work in Ivory Coast's relatively prosperous cocoa-led economy. Some 14,000 people have already fled to neighbouring Liberia following November's disputed election results, and the UN says it is prepared for a total of 30,000 refugees in the region. The UN has said at least 173 people have died in violence already. Most of those fleeing are supporters of Mr Ouattara, who, along with his cabinet, is based at a hotel in Abidjan under the protection of UN troops. Mr Gbagbo has demanded that UN and French troops leave the country and a close ally has even warned that they could be treated as rebels if they did not obey the instruction. 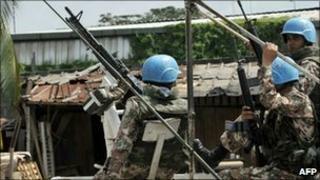 The UN, which has 10,000 peacekeepers in the country, rejected the call. The election was meant to unite the country after a civil war in 2002 split the world's largest cocoa producer in two, with the predominantly Muslim North supporting Mr Ouattara and the mainly Christian south backing Mr Gbagbo.